It’s A Bird! It’s A Plane! No, Wait – It’s Ed! Could That Be A Hero? I think he was Superman. It all started pretty normally. He was born in a small town in Mississippi, one of nine children. From early in his life, he knew he wanted to be a military man. He fulfilled his dream, serving in both the US Navy and the Army. In fact, he joined the Navy and served in WW II before he ever graduated high school! After the war, he went back home, and completed his high school degree, and then it was off to the service again – this time the US Army. He fought in Korea, and survived the Battle of Pork Chop Hill, in which 257 of his fellow soldiers died. Only 14 men survived the first skirmishes. 14 out of 271. Like I said – Superman. During that battle, he received a battlefield commission promoting him to second lieutenant. He turned around and immediately led his men back up the hill, back into the thick of combat. He had neither the time nor the luxury of fear or hesitation. Ed W. “Too Tall” Freeman was a hero. A true, honest-to-goodness American hero. Ed always wanted to be a pilot, but he exceeded the height limitations. He was “too tall” for pilot duties – hence the nickname. But Ed wasn’t one to give up easily on his dreams. He had joined the military and served in two branches and two wars because that’s what he wanted to do. He trusted that things would work out as they should. And sure enough, in 1955 the height limits were changed, and Ed became a pilot. He fulfilled his dream, and learned to fly. I’m telling you, he was Superman. Isn’t it interesting how some people seem to be guided and set aside for a particular task or time? It’s as though their calling – their passion – is a spark, an engine and a homing device, all in one, that moves them into their perfect place. That’s how it was with Ed. Think about it. Like I said, he survived a two-year assignment on the USS Cacapon during WWII. He then survived the Battle of Pork Chop Hill, beating the odds in which 271 men went in, and only 14 came out. And now, inexplicably, the height limit for pilot training was raised, and Ed realized his dream of becoming an aviator. But perhaps there was something else at work here. Although Ed was already a hero, he was about to become the stuff of legend. The date was November 11. The year was 1967. 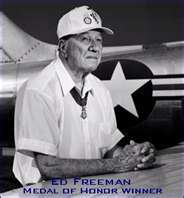 Ed W. Freeman was a helicopter pilot in Vietnam. He was nine days shy of his 40th birthday. The area around LZ (Landing Zone) X-ray was hot. US Forces were surrounded and outnumbered by the enemy nearly 8-to-1. The brass on the ground had instructed that all helicopters were to clear the area – including the MedEvac teams. There were wounded men – teen-aged boys, really – in the middle of that hell, watching the choppers peel off, one by one, each turn of the rotor taking them further away from the wounded and damned. The boys huddled on the ground, perhaps praying for a quick end, knowing the situation was hopeless. And then Ed showed up. 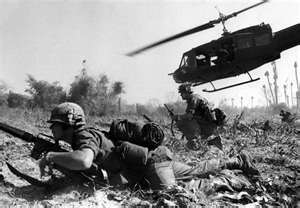 Flying a lightly armored, unarmed UH-1 Huey, he landed in the middle of that maelstrom of enemy fire, taking hits. And waiting. Waiting for some of those teenagers to be loaded onboard so that he could fly them to safety. Again and again he returned, his chopper pocked with bullet holes, the Perspex windows cracked and broken, smoke billowing from the motor. Fourteen times he dropped into that caldron of Hell, until he had flown every wounded soldier to safety – all 30-plus of them. He sustained four bullet wounds during the extraction. Ed Freeman was Superman. Ed Freeman was an American warrior. Ed Freeman was a hero. He retired as a Major in the US Army, and went home to his wife and two sons. When he got home, I wonder how many people passed him on the street, or saw him in the market, or sold him a car or socks or fishing gear, never knowing how close they were to a living legend. How many people greeted him at the Post Office and never realized that he had his very own Post Office – the one in his hometown had been named after him! Or maybe they saw him at the grocery store, unaware of the scars he bore in his body from bullet holes, unaware of the magnificent spirit contained in that aging body. Unaware. How many sensed the man he was? How many knew the truth of his bravery? I know of at least 30 young men who were keenly aware. I wonder what those 30 young men rescued by Ed on that November day did with their lives? I wish I could have met Ed “Too Tall” Freeman. I would like to have had a glass of iced tea with him. Not to talk about the war or his heroic exploits, but just to meet the man whose spirit was so powerful that it transcended risk or danger – or even death. Yes, death. Because Ed passed away a few years ago. His passing went relatively unnoticed, which seems wrong to me. It seems that there should have been silence and fanfare and weeping and flags flown at half mast, and maybe even a disturbance in “the force”. Because Ed was a hero. But even Superman can die. How many heroes do we meet every day, unaware of the immensity of their spirit cloistered in a body that has become old and frail. How much we owe these silent men and women, how much respect is due them. They have a story to tell and wisdom to share, and courage to inspire. Learning about Ed made me want to be a better person. It made me, in some small way, want to be a hero to someone. Oh, don’t get me wrong – I’m not thinking of anything like Ed did. But maybe something simple. Maybe, at the end of the day, our most powerful days are those when we are able to make a difference in the life of someone else. And boy, we could use some of those things right now. We need a few more Supermen. We need a few more “Ed’s”. This entry was posted on Friday, May 4th, 2012 at 6:57 pm	and posted in Uncategorized. You can follow any responses to this entry through the RSS 2.0 feed. « What Do I See?